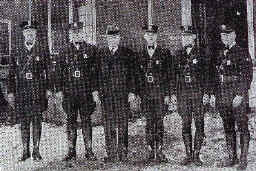 The Minnesota State Patrol was created in 1929 when Charles M. Babcock, the Commissioner of Highways, appointed Earl Brown, Sheriff of Hennepin County, as Chief of the Highway Patrol. 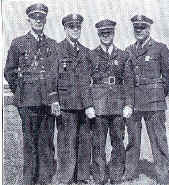 On July 1, 1929, Chief Brown appointed 8 officers. The first training school was held January 18 to April 1, 1930. This school graduated the first 35 members of the Minnesota Highway Patrol. Thanks to a relative of George Kuch, one of the original 8 members, we have some old pictures of the earliest Trooper’s. The photo’s were scanned from a copied image so the quality isn’t perfect, but then again, the photo’s are over 60 years old! Thanks to Diane Lindstrom, the History of the Minnesota State Patrol was compiled up to 2002. The document is rather long (…about 73 pages) and they are all in one file. The document will appear in a new window and will load as you read. You can see the document on-line by clicking here. The History document is current up to the 46th Class (2001). Contact us to add to the History Section. J.G. Dahl, and George J. Kuch. The five Officer’s rank as Lieutenants.